NovelAire Dehumidifiers are manufactured by NovelAire Technologies based in Baton Rouge, Louisiana. NovelAire has been at the cutting edge of energy control and desiccant technology since the company was founded, twelve years ago. It is a major supplier of energy control and desiccant wheels to customers throughout the world and has used its experience of these technologies to develop and bring to market a range of innovative solutions for commercial, residential and special purpose humidity control applications. NovelAire has supplied energy conservation wheels for the Burj Dubai Tower, the world's tallest building, and technology and products for the Hubble Telescope and the Space Shuttle. Its move into the less glamorous commercial, government and residential dehumidifier markets provides an opportunity for a wider user population to benefit from its energy efficient and original products for humidity control. The ComfortDry 250 Whole House Dehumidifier is unlike better known products from Ultra-Aire, Aprilaire and Honeywell. 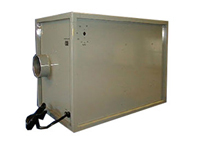 It is a desiccant unit which uses a water absorbing material to capture water from the air. The desiccant type needs a source of heat to drive the water from the desiccant material when it is saturated. This NovelAire dehumidifier uses hot water as the heat source and this unusual approach allows this unit to achieve exceptional energy efficiency. Many people are a little nervous about "new" and different technology but you may be reassured to know that desiccant units are common in commercial and industrial settings and that NovelAire are among the world leaders in this field. An added advantage of this type is that it is more reliable than the more highly stressed refrigerant models and should last considerably longer. The ComfortDry 400 Whole House model uses the same technology as the ComfortDry 250 but is more powerful to work effectively in a larger home. Whereas the 250 will remove up to 105 pints per day this NovelAire dehumidifier is capable of extracting 150 pints, nearly 50% more water. Where it differs from the 250 is in the source of heat used to dry the desiccant. Unlike the 250, which uses hot water, the 400 makes use of natural gas or propane. If you need a very low level of humidity in your home you may prefer a desiccant unit as it can achieve much lower levels than any refrigerant whole house model. There is no condensate to dispose of with the ComfortDry 250 and 400. When the desiccant is dried by applying heat the water is converted to vapor and this vapor is vented, with the warm air, to the outside of your home. The ComfortPlus 300 Whole House model takes desiccant technology a step further by combining it with the more familiar refrigerant process to achieve even higher levels of energy efficiency. The air is pre-dried on cold evaporator coils to condense out some of the water, as in a refrigerant unit, and then passed over the desiccant material which traps yet more water. The source of heat to dry the desiccant is the warm air generated by the condenser coils of the refrigeration system. In a typical dehumidifier this heat would simply be wasted but using it to dry the air more thoroughly and quickly enables the ComfortPlus 300 to achieve exceptional energy efficiency. Using this hybrid process this NovelAire dehumidifier is able to attain an energy factor of 4.6 litres of water per kilowatt hour of electricity used. To put that in perspective an Energy Star qualified 70 pint portable has an energy factor of only 1.8 ltr/kwh! 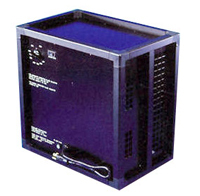 The DH 250 Desiccant Dehumidifier is a powerful unit designed for use in a variety of commercial and industrial applications, including water damage restoration. This NovelAire dehumidifier is capable of pulling as much as 184 pints per day from the air so is suitable for use in large enclosures. This unit can be permanently installed but is also portable for use at multiple locations. The DH250P version is equipped with both carrying handles and wheels and weighs a manageable 95lb. Desiccant models are not always the most suitable units for use in every application but are essential where effective low temperature operation or extreme dryness is required. 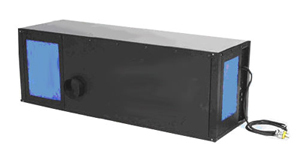 The DH 100 is a lower capacity desiccant unit which will be of interest to businesses and organizations that have small areas in which extremely low humidity is essential or where temperatures are too low for a refrigerant unit to be effective. 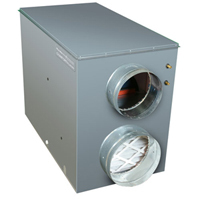 This NovelAire dehumidifier was originally developed for use by armed forces which store items of high value in secure facilities which require accurate humidity control to prevent costly degradation of moisture sensitive equipment. In military applications security is typically a high priority while frequent access to the storage facility is likely to result in unwelcome increases in humidity when outside air enters the storage area. To deal with both issues a remote humidistat is available if required. 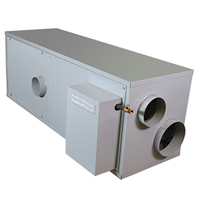 Many private and public organizations have humidity control requirements which are almost identical to those of the military and the DH100 is ideal for maintaining low humidity levels in a variety of storage and processing areas operated by these organizations. The DH 55 is another unit designed to meet military requirements. It is exceptionally compact and weighs just 27lb. Military requirements emphasise operational readiness and where moisture sensitive items critical to that readiness are stored humidity control must be reliable. For this reason the DH 55 was designed to meet exceptional standards of ruggedness and dependability. This Novelaire dehumidifier is suitable for use in small areas, of up to 143 square feet, and will control humidity to an extremely low level even where the temperature is as low as 0°F. Commercial requirements may be framed very differently from those of the armed forces but there are many applications where the requirement for extreme reliability is as acute. Life and limb may not be at stake but often the bottom line and the careers of individuals may be!